Monday marked a historic event when SpaceX successfully landed the Falcon 9 Rocket after launching satellites into orbit. The New York Times reports a launch commentator exclaiming “The Falcon has landed,” to cheers and applause. This marked the third attempt to land the rocket. How does an innovative company power this accomplishment and their dream to put humans on Mars? Through the more than 3,000 men and women working in their facilities engineering, building, and launching these rockets. More than 300 of those employees are veterans, and SpaceX continues to turn to veterans for top talent for Operations, Engineering and Skilled Technician roles through a Military Talent Program through Orion International. innovative thinking, they’d be wrong. 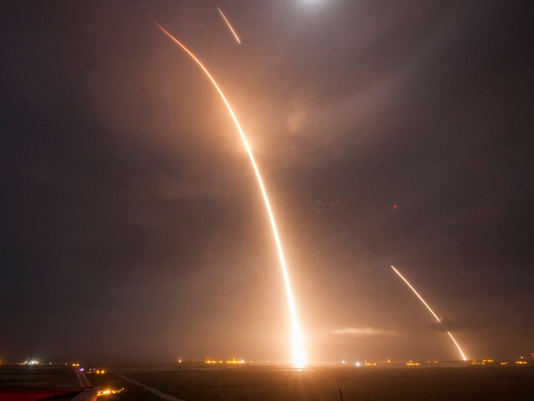 SpaceX is successfully leveraging veterans’ ability to manage a project, be it building or launching the rocket, through to completion, in mission critical situations demanding endurance, stamina and flexibility. SpaceX understands that veterans have developed the capacity to know how to accomplish priorities on time, in spite of tremendous stress. The technological-savvy veterans at SpaceX come from all branches of service and enjoy their careers. Nicholas Lindsay, Test Engineering at SpaceX and a Navy veteran, explains “I now work in the Aerospace Engineering industry, more specifically Aerospace Test Engineering. I was hired as a Test Engineer and have been given continually increasing levels of responsibility including two promotions within my first two years with the company. I am now a Test Engineering Manager and responsible for all test related activities for the Dragon Spacecraft and its systems. Travis Guthrie, a former Nuclear Machinist Mate who is now a Friction Stir Weld Supervisor at SpaceX, is featured in the September issue of GI Jobs in an article titled "Better Off for Having Served", as well as in a Senior Enlisted Profile. In the cover story, Guthrie is highlighted as a great example of how veterans are able to successfully transition thanks to their service. Congratulations to SpaceX as they come one step closer to developing the technologies to make human life on Mars possible. We’re happy to see veterans playing a role in this historic feat. Want to learn more about how veterans can help take your company to the next level? Click here to visit Orion International and read more about Military Talent Programs and how you can start one today.